For “piloting” & for riding tandem (we will always have another trained volunteer riding a bike separately as an extra hand or in case of an emergency.) Training provide by J2R. We also can always use volunteers in many other ways also, from fundraising and marketing, to maintenance or help with ideas even! You name how you’d like to help! The guest rider, volunteer “pilot” and tandem rider will together decide how long they want to ride take particular day. The average ride will be about about 20-30 minutes but could be shorter or longer. 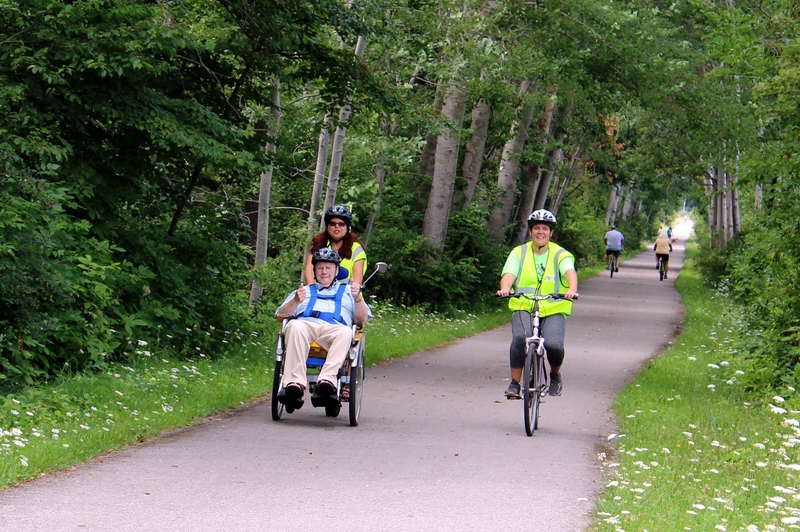 Speed will be approximately 6-8mph to fully enjoy the fresh air and scenery of the trail. Most anyone can ride, but there are a few requirements. People who can NOT participate are individuals who have severe postural issues, decubitus ulcers, or other conditions that prohibit them from sitting upright in the wheelchair. Also those with extreme, unpredictable behaviors, and those with acute illnesses can not be a “rider”. We are always in need of raising funds to continue the free program. From recruiting volunteers & participants, to storage, transportation, maintenance, supplies (helmets, signs, forms, marketing), the insurance for bikes, volunteers, & riders, and of course to purchase another bike or two for more people to enjoy the trail! 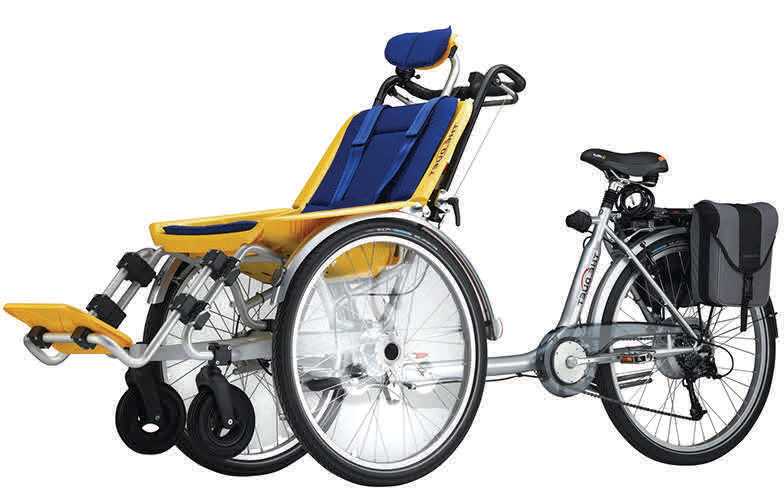 The Duet™ is an orthopedically shaped fiberglass wheelchair attached to the back half of a bicycle with a battery assist pack to aid on hills and to provide a smoother ride. The chair has good suspension and light handling, and its off road tires are excellent on gravel and dirt tracks if needed. There are twin drum brakes on the chair’s wheel, and a back‐ pedal brake on the cycle wheel. The bikes can accommodate both a “pilot” rider up to 275 pounds and a passenger up to 275 pounds. The bikes will have battery powered motor assist, which enables trained volunteer “pilots” of all ages and athletic ability to volunteer to pedal and not worry about being “strong enough” to pilot the vehicle.